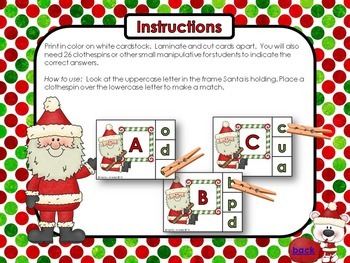 Santa Knows His ABCs comes with 7 progressively more challenging activities to develop and strengthen your students' ability to look at letter symbols critically. The variety of activities provided in this activity pack will assist students in becoming proficient at recognizing distinctive letter features of lower and uppercase letters. 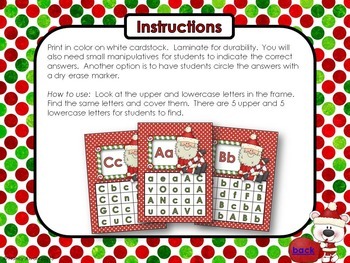 Once students have mastered letter identification, move to the next activities to give your students practice making upper to lower and lower to uppercase letter matches. Twenty-one reproducible pages of varying difficulty and skill level are included to extend their learning. Use reproducible pages for accountability, extra practice, homework or a quick assessment. 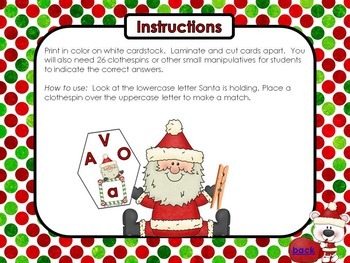 The activities in this Santa themed activity pack lend themselves to small group instruction or as independent ABC learning station activities. Be sure to download the product preview to review complete instructions and product samples before you make your purchase decision. Be sure to visit my blog www.teachingwithnancy.com for additional teaching ideas and free resources. Some graphic copyright DJ Inkers and Scrappin' Doodles.